Nadi International Airport (IATA: NAN, ICAO: NFFN) is the main international airport for the Republic of Fiji as well as an important regional hub for the South Pacific islands, located by the coast on the western side of the main island Viti Levu. It is the main hub of Fiji Airways and its domestic and regional subsidiary Fiji Link. The airport is located at Namaka 10 km from the city of Nadi and 20 km from the city of Lautoka. In 2016, it handled 2,047,476 passengers on international and domestic flights. It handles about 97% of international visitors to Fiji, of which 86% are tourists. Despite being Fiji's main airport it is a considerable distance from the country's major population centre; located 192 kilometres (119 mi) northwest of the country's capital and largest city Suva and its airport, Nausori International Airport. 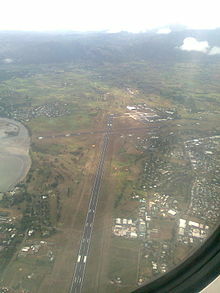 The original airstrips at Nadi were built by New Zealand from August 1939, being completed in March 1940, and were paid for by the British colonial authorities. They were extended by New Zealand from November 1941; the first 7,000 feet (2,100 m) runway was completed by January 1942 and the other two by April 1942. The work was requested by the United States of America for the South Pacific air ferry route and paid for as reverse Lend-Lease. In 1941 American engineer Leif J. Sverdrup discussed progress on the airfields with Walter Nash, then New Zealand Minister of Finance. Nash recalled Sverdrup saying that there was no formal agreement for payment for what was called Nandi Airport by America, so on the back of one of his cards Sverdrup drew a cross representing the airfield, wrote "£250,000" (pounds) and initialled it "L.J.S." The extension was actually estimated to cost £750,000 (pounds). The airfield was used by the United States Army Air Forces when the Pacific War began in 1941, as USAAF Nandi [sic]. Early in the war, B-17 Flying Fortresses were flown from Nadi against Japanese targets in the Philippines and Solomon Islands. In 1943, the 42d Bombardment Group flew B-25 Mitchells from Nadi. During this period, the U.S. Navy used the airfield as well, labeling it Naval Air Facility Nandi (NAF Nandi). After the war ended, control of Nadi Airport was handed over to New Zealand on 20 December 1946, and the Civil Aviation Authority of New Zealand began operations from Nadi in 1947. At independence in 1970, the Fijian government began participating in the organisation of Nadi Airport, and full control was handed over in 1979. The first tarmac runway was constructed in 1946 at a cost of £46,500; 7,000 feet (2,100 m) by 150 feet (46 m) . Nadi Airport in 1971 showing the open-sided covered walkways between the aircraft and terminal. A Canadian Pacific Air Lines DC-8 is pictured. Then, as now, Fiji was the crossroads of the Pacific – and in those days was even more important as a refuelling stop. The apron was shaded by palms, crotons and hibiscus trees, with whitewashed stone paths connecting it to the terminal. These have now been lost under concrete as the apron has expanded over the years, as aeroplanes larger in both number and size land at Nadi. In the 1940s and '50s, the airport's official name was Colony of Fiji: Nadi Airport, although foreign timetables continued to spell the name in phonetic English: Nandi. 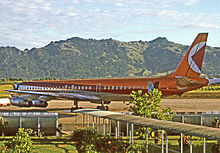 During the first half of the 1960s, Nadi served as a key airport for transfer of passengers from Auckland's Whenuapai airport which could only take turboprop and piston aeroplanes, onto the new DC-8s and Boeing 707s bound for North America and Europe. At one time, New Zealand controlled the world's largest Flight Information Service (FIS), which at its largest stretched to 10,360,000 square kilometres. All of this was controlled from Nadi. Drama came to Nadi Airport on 19 May 1987. The first coup had just occurred (14 May 1987). Prime Minister Dr Timoci Bavadra and his cabinet were under arrest, and tension continued to rise in the country. Air New Zealand Flight 24 made a scheduled stop to refuel, en route from Tokyo (Narita Airport) to Auckland. Ahmjed Ali, an aircraft refueller, used his security card to board the aeroplane and, once in the cockpit, showed the captain that he was carrying dynamite. He wanted passage out of Fiji and the release of Dr Bavadra. The passengers and cabin crew were able to disembark, while Air New Zealand negotiators in Auckland and Ali's relatives in the Nadi control tower attempted to defuse the escalating situation. Eventually, the flight engineer hit Ali over the head with a bottle of duty-free whisky, and he was handed over to the Nadi police. An aerial photograph of the airport from the southwest. Runway 02 is in the middle of the photo. Arrivals and departures are much preferred to be to the south, due to the closeness of the Sabeto mountain range to the immediate north of the airport. A large turn around area, suitable for Boeing 747s, is to the left of the threshold of Runway 02, in case meteorological factors make departure to the north necessary. In 2008, a Qantas Airbus A380 had to make an emergency landing to disembark a sick passenger, showing that whilst not certified, the facilities at Nadi are sufficient to cater for the largest passenger aeroplane in the world. Today, the largest concentration of hotels in Fiji has grown up in and around Nadi. As tourism took off in the 1960s, the resorts under construction in the nearby Mamanuca Islands and Denarau Island cemented Nadi as the centre of Fiji's tourism industry. Nadi is the operational base for Fiji Airways, which services six airports throughout the southwest Pacific, and many more on the Pacific Rim. The Civil Aviation Authority of Fiji (CAAFI) head office is at Nadi Airport. Fiji Airways has its head office in the Fiji Airways Maintenance & Administration Centre at the airport. In addition, Fiji Airlines Limited, operating as Fiji Link, is headquartered at the Pacific Sun office at the CAAFI compound. ^ a b "Annual Report 2016" (PDF). ^ Sinclair, Keith (1977). Walter Nash. Auckland University Press/Oxford University Press. ISBN 0 19 647966 5. ^ "Contact Details Archived 2012-03-21 at the Wayback Machine." Civil Aviation Authority of Fiji. Retrieved on 13 December 2011. "Postal address Private Mail Bag NAP 0354 Nadi Airport Fiji Islands"
^ "Membership Archived 2011-12-13 at the Wayback Machine." International Air Transport Association. Retrieved on 13 December 2011. "Air Pacific Limited Air Pacific Maintenance & Administration Centre, Nasoso Road, Nadi Airport, Nadi Fiji"
^ "Contact Us." Fiji Airlines Limited. Retrieved on 3 October 2009. "Fiji Airlines Limited, trading as Fiji Link, was incorporated as a wholly owned subsidiary of Air Pacific Limited currently having its main base at the Pacific Sun office, CAAFI Compound, Nadi Airport, Fiji Islands." and "Head Office Pacific Sun PO Box 9270 Nadi International Airport Fiji Islands"
^ 2018, UBM (UK) Ltd. "Fiji Airways Resumes Solomon Islands Service from Feb 2015". ^ "Welcome to our home - Flights to Fiji - Fiji Airways". www.fijiairways.com. ^ "Home Page - Pacific Islands Report". pidp.eastwestcenter.org. ^ "Rosie Holidays Marks Chinese New Year With Charter Flights From Hangzhou". Fiji Sun. Retrieved 21 August 2018. ^ 2018, UBM (UK) Ltd. "Fiji Airways Plans Taipei Charter in Feb 2016". ^ "Hibiscus Air operates daily scheduled flights to Pacific Harbour from Nadi,". Retrieved 2 November 2017. ^ "Pacific Island Air - Fiji Airplane Services - Charter Airplane Flights in Fiji Islands". www.pacificislandair.com. ^ "QANTAS SAYS 'BULA' TO FIJI WITH DIRECT FLIGHTS FROM SYDNEY". Qantas. 21 January 2019. Retrieved 21 January 2019. This page was last edited on 8 April 2019, at 04:46 (UTC).